USA Dime Razorback 10K, Other Shape Guitar from Dean Guitars in the Dime USA series. Dean Guitars introduces the USA Dime Razorback 10K, a diamond plate top version of this very successful model. In only three years, the Razorback has become one of Dean's best selling (10,000 units shipped -- hence the name "10K" for this model aimed at celebrating this milestone) and most recognizable guitar lines, with its barbed wire-like ultra-sharp points and massive presence. 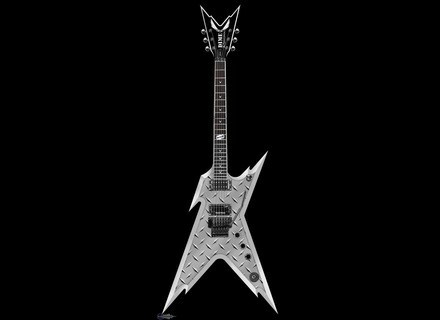 The Razorback is a 21st century evolution of the Classic Dean ML shape Dimebag Darrell first played over 2 decades ago. Each Razorback 10K features a mahogany body outfitted with a locking Floyd Rose Tremolo system, and comes loaded with a Duncan Dimebucker in the bridge position, black Grover tuners, and Dime's trademark traction knobs. The Razorback's Mahogany neck is capped with the wing headstock bearing the Dime logo. A rosewood fingerboard with a signature pearl razor blade inlay at the 12th fret completes the design.